The iNewton – Apple’s new touch screen computer? Sorry I couldn’t resist. 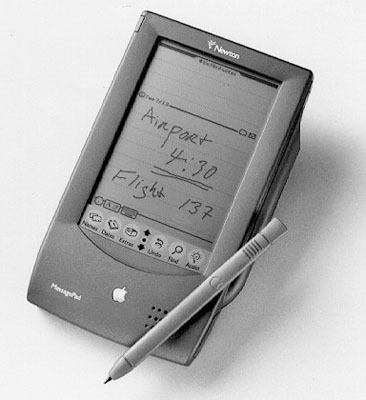 Everyone is coming up with names for the new (rumoured) Apple touch screen computer and since I remember the Newton I thought it would be good for a laugh. For those who weren’t around when the Newton came out and took the industry by storm (actually it was more of a drizzle) it was good idea ahead of it’s time. As an idea it was ground breaking. As a device it was a failure. The handwriting recognition was so poor that whatever you wrote would come back totally unrecognizable. But it did spark the idea that you could carry a computer in your pocket. Think about it – first the Newton, then PDA’s, then along came the smartphone. As bad as it was, the Newton was typical of the innovation that was and may still be Apple. Steve Jobs is, was and will always be a genius. I can’t help but wonder why he hasn’t come up with a touch screen computer before now. I mean a real computer, not just an entertainment device. Personally I think touch screen computers have a limited and niche use. Maybe Steve Jobs does too and that is why Apple has been behind the curve on this. It’s not like Apple (or The Steve) to give the public something just because they are clamoring for it. Jobs is usually a few steps ahead of everyone else. He gave us the iPod and iTunes and the iPhone even when we didn’t know we needed them. Instead of the iNewton he’ll release something we didn’t expect and within twenty-four hours we’ll wonder how we lived this long without it. BTW: In case you haven’t seen this one before . . . So they named it the iPAD – a large iPOD and not a computer. Why would they make another computer when they already have MacBooks and iMac’s? The fact it doesn’t support Adobe Flash (what most web based video runs on) is narrow minded. It might be good for Apple and iTunes but these types of exclusionary tactics don’t always lead to cornering the market.